Previously, Jarosław Kaczyński, the country’s unofficial but de facto ruler, has carefully and successfully balanced the various factions within the ruling camp (which, as well as his own PiS party, includes the smaller Solidarna Polska and Porozumienie). But he has now granted clear dominance to the more moderate, business-friendly wing. Meanwhile, major figures associated with PiS’s traditional national-conservative and religious base have been demoted or removed entirely. Although the new team still contains some hardline figures, like Zbigniew Ziobro, the justice minister, and PiS loyalists, such as Mariusz Błaszczak, who moves from interior to defence, it very much bears the stamp of recently appointed prime minister, Mateusz Morawiecki, suggesting he will be a more powerful figure than his predecessor, Beata Szydło. She was widely regarded as prime minister in name only, with Kaczyński pulling the strings from behind the scenes. The PiS chairman will remain ultimately in charge, but has clearly given Morawiecki more control. The reshuffle also gives greater prominence to figures associated with the deputy prime minister (and leader of Porozumienie) Jarosław Gowin, who has tried to push the government in a more business-friendly direction and has expressed disquiet at some of the more radical aspects of its agenda, such as judicial reform. The cabinet will likewise be more to the liking of the president, Andrzej Duda, who has been in a long-running dispute over control of the armed forces with the defence minister, Antoni Macierewicz, who has now been dismissed. International coverage has presented the reshuffle as an attempt to curry favour with the European Union, and certainly this must have played a part. The replacement of Witold Waszczykowski, the gaffe-prone, spikey foreign minister, with Jacek Czaputowicz, an academic and civil servant who has operated away from the political front line, may help ease relations with European partners. Similar thinking motivated the decision last month to install the urbane, multilingual former banker Morawiecki as head of the government in place of the more parochial and folksy Szydło, who never seemed comfortable in the international arena. The fact that Czaputowicz is a relatively unknown, technocratic figure suggests that Morawiecki himself, as well as Duda, will play a major role as figureheads of foreign policy. The departure of the environment minister, Jan Szyszko, will also ease international relations. He made the controversial decision to increase logging in Białowieża forest, which has resulted in UNESCO threatening to rescind its status as a world heritage site and the European Commission launching legal proceedings that could result in huge fines for Poland. Szyszko, a climate-change sceptic and fan of coal, would also have been the chair of this year’s UN climate summit in Katowice, a potentially embarrassing situation that will now be avoided. However, today’s reshaping of the cabinet is aimed primarily at a domestic audience, ahead of local elections this year and parliamentary ones in 2019. The intention is clearly to appeal to more moderate voters – the type who may otherwise favour for the centrist/liberal opposition (or not turn out at all) and for whom the religio-nationalist conservativism and conspiratorial rhetoric of the Szyszko-Macierewicz wing holds little appeal. A change in tactics or strategy? Yet major questions remain, in particular over the extent to which this represents merely a tactical switch ahead of those elections or a more fundamental strategic shift by Kaczyński. An argument in favour of the former interpretation is that a very similar approach was adopted in 2015, when PiS won the presidency and an unprecedented parliamentary majority by downplaying its more radical rhetoric and aims and instead presenting a moderate face, helping it to appeal beyond its traditional and loyal base. The likes of Macierewicz and even Kaczyński himself took a back seat during that year’s campaigns, which were fronted by the more conciliatory Duda and Szydło. Once PiS secured power, however, it reverted to a more confrontational approach and pursued the radical agenda of state overhaul that had long been Kaczyński’s aim. It may now simply be switching, temporarily, back into election mode, hoping to repeat the trick. Yet things could be different this time. Given that PiS has achieved its aim of securing greater influence over the judiciary, civil service, armed forces, state media and other key institutions, Kaczyński may have decided it can now shift to being a more traditional party, focusing on bread-and-butter economic and social issues while avoiding some of the domestic and international rancour it has provoked over the last two years. The departure of Macierewicz is particularly significant in this regard. He has long been the promoter-in-chief of the conspiracy theory that the Smolensk plane crash which killed Kaczyński’s brother, Lech, then the president, was a deliberate assassination. This became a central component of PiS’s narrative regarding a shadowy ‘post-communist’ elite that, aided by foreign interests, controlled Polish politics, business and state institutions, preventing the country from becoming truly independent after 1989. That narrative, while useful in opposition and the early stages of government, was always going to be harder to sustain the longer PiS was in power, especially once it had restructured and purged those institutions. Indeed, the increasingly farcical attempts of Macierewicz’s Smolensk investigatory committee to produce evidence of wrongdoing have becoming something of an embarrassment, and are even having the opposite effect to that intended: surveys suggest that fewer Poles today believe in the idea of a deliberate attack than did two years ago. Meanwhile, polling shows that PiS enjoys huge and growing support, with this popularity based not upon its overhaul of the state (which most Poles either oppose or are indifferent to), but on its successful management of the economy and its redistributive social policies. Morawiecki, as minister for finance and development, was a key architect of this success, and his appointment as premier, along with the new cabinet installed today, suggests that Kaczyński may have decided that economic nationalism, rather than the religio-cultural variety, is PiS’s new winning formula. 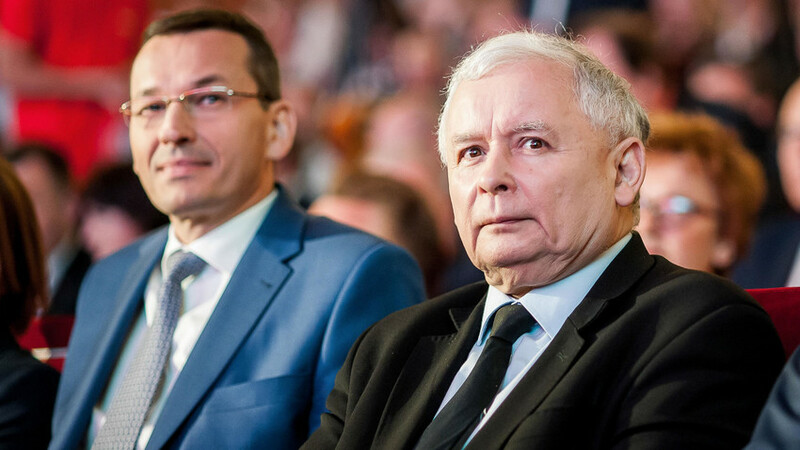 Whatever the case, today’s reshuffle clearly represents a risk to Kaczyński. The party’s traditional base, and the conservative media that give it a voice, were already sceptical of the decision to replace the popular Szydło with Morawiecki, who was not even a member of PiS when he joined the government two years ago. The decision now to remove national-conservative figureheads Szyszko and Macierewicz risks causing open unrest. The editor of conservative Gazeta Polska has already expressed his anger at the latter’s departure, and late last year a social media campaign, #MuremZaMacierewicza (roughly: #StandBehindMacierewicz), was launched by his nationalist supporters. Both those ministers were, moreover, closely associated with Father Tadeusz Rydzyk, who up until now has used his media and other resources to support the government (which since coming to power has directed generous state subsidies to his various business interests). Rydzyk, who weekly Wprost recently ranked third in its list of the most influential people in Poland, clearly has the ability to hurt PiS should he wish. Kaczyński, however, is an experienced and wily political operator. He will have attempted to smooth out such concerns in advance behind the scenes. It was noteworthy that Morawiecki’s first interview as prime minister was given to Rydzyk’s TV station, in which the formerly moderate figure gave some uncharacteristically radical statements about, for example, his aim to ‘re-Christianise Europe’. The PiS chairman may also be counting on the fact that, as during his moderate shift in 2015, PiS’s more radical voters have no other party to turn to. However, if today’s move was indeed part of a longer-term strategic shift, and if the likes of Macierewicz and Rydzyk are not kept on board, then there is clearly the danger of a new challenge from the right.